The answer is: some different. Although the difference between the two is only one word, and the meanings of "cooking fume" and "oil mist" are similar, among the classifications in the industry, the fume purifier and the oil mist purifier are two different devices. 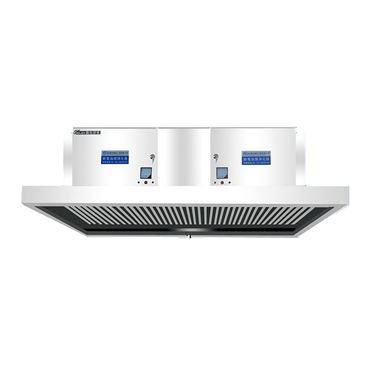 The application environment of the fume purifier is mainly a commercial environment, such as a food and beverage unit, such as a restaurant, a canteen, a hotel, a food processing shop, a restaurant, and the like. The oil mist purifier is towards the industrial environment, such as machining, forging, injection molding, cutting, welding, chemical production, chemical cleaning, etc., which environment with volatile organic compounds,such as oil mist and dust are released. The fume purifier handles a large amount of air, because most of its units correspond to a kitchen. The space is large and the amount of cooking fume is quite obviously. Therefore, the air volume required by the fume purifier is generally large. The oil mist purifier has a small air volume, because many industrial oil mists contain toxic components. The general working unit will be equipped with an air suction pipe, which requires the oil mist and exhaust gas to be accurately absorbed and discharged, so the required air volume is small, There is no need for large air volume fan , so that save more power. In fact, the work principle of both equipment is the same basically, and the cooking fume and oil mist are absorbed and purified by electrostatic adsorption. But as mentioned at the second point, the lampblack purifier is larger than the oil mist purifier. Relatively speaking, the fume purifier is slightly higher than the oil mist purifier in price. Compared with the same electrostatic fume equipment. Taking Gojek electrostatic fume purifier as an example, after verified by national institutions, its purification rate can reach 98.4%. Taking Gojek oil mist purifier as an example, after purification by national institutions, its purification rate can reach 98.5%-99%. This is because the fume purifier needs to handle a higher concentration of the fume mixed gas, and the high-voltage electric field has a slightly lower catch rate. The oil mist purification rate needs to be treated with a low concentration of the oil mist mixed gas, and the high-voltage electric field has a high catch rate. In some areas of small air volume treatment, the two can replace each other, but in the usage of large air volume treatment, the oil mist purifier can not replace the fume purifier. In addition, for some different commercial and industrial environments, different auxiliary equipment needs to be added. For example, in the situation of oily smoke and odor, the fume purifier needs to be used in accordingly with the UV light to remove the scent. For example, in the situation of large fume, the oil mist purifier needs to mach an industrial dust collector to use together.